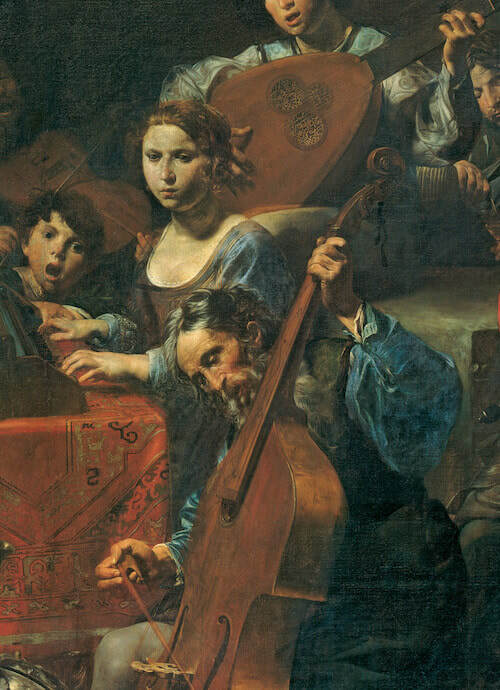 ​Accompaniment along a thorough bass represents the center of a lutenist’s professional activity. The key quality is flexibility: Adjusting to the singer, the ensemble, the conductor, the appropriate style, timing, harmonisation, instrumentation, environment, the circumstances. At times this also demands taking the lead or blending with another instrument, providing embelishment or strictly foundation. Basso continuo is an improvisational approach both in the contrapuntal as in the situational sense. The aim is always to enrich the bigger picture in the most effective way – be it for a duo, chamber ensemble, or baroque orchestra. If you wish to book me for a performance, you can contact me directly via lks.henning@gmail.com! Here, the aim was to apply the style of figuration found in the composer's theorbo solos to the realization of a typical early-seicento bass line in a solo-continuo setting. With co-students at Schola Cantorum Basiliensis. In this canzonetta I instead used the theorbo to assume the roll of a fundamental bass, giving way to the harp, guitar & viol above. With Luis Martinez-Pueyo & Babak Mahmudian. In a trio the theorbo can have the tendency to get in the harpsichord's way. Here we searched for ways to have the two instruments complement each other. Taking cues from Robert de Visées theorbo style I applied a more conversational realization approach prompted by this particular movement's intimate quality. With orchestras in large opera halls the theorbo's principal focus is to provide contour in the bass register. This galant setting calls for simplicity and lightness, hence the choice to occasionally substitute vertical harmonization with horizontal figuration or a minimal two-part realization. In accordance with the compositional style the objective was to draw a wide range of sound colors and techniques out of the theorbo, but without entirely leaving historical boundaries.